Whenever Marjorie and I are in the vicinity of Greenbelt in Makati, we make sure to visit Pinkberry Greenbelt beside Chelsea restaurant to enjoy a swirl of frozen yogurt when the time permits. There was even a time that we finished a whole ‘take-out‘ pint while ‘dining-in’. 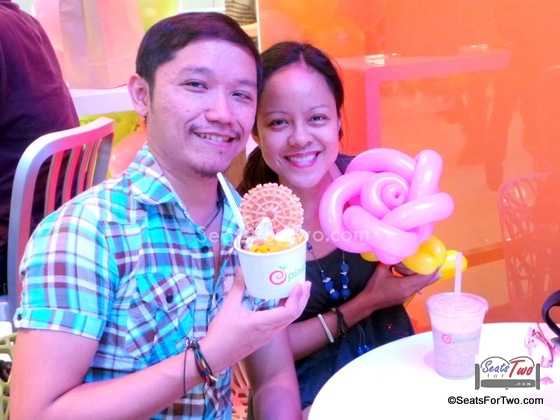 When Marj moved from Bulacan to the Guadalupe area in 2012 when she was still my fiance, our branch of choice also moved from Greenbelt to Pinkberry Powerplant in Rockwell. That branch served as our chillout spot at the lower ground floor after jogging from her place near Guadalupe-EDSA all the way to the Powerplant Mall. Upon the invitation of our friends from Pinkberry, we joined their Pinkberry SM Megamall branch grand opening about a week ago. it was held at the 4th floor of SM Megamall‘s new building – the Mega Fashion Hall – right across SM Ice Skating Rink. 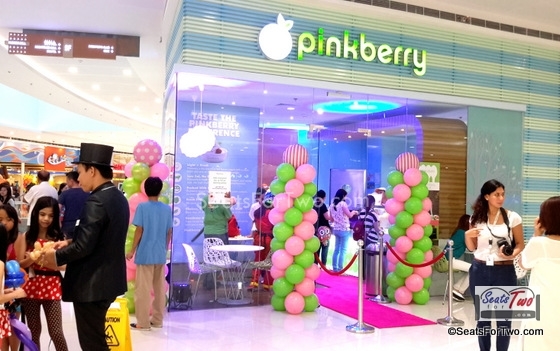 The store front was filled with customers and merrymaking to the color-theme of pink and green staying true to the Pinkberry brand. It was made even more fun and colorful with the balloon artists who freely customized balloon arts for families and their kids. 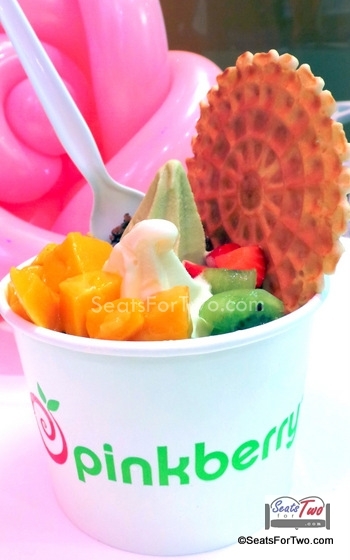 Customers were also treated with a 20% off on any Pinkberry products that day – April 11, 2014. 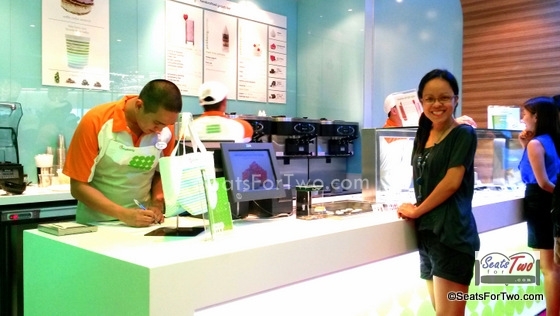 Although we both love the Waffle Cookie Sandwich, we decided to have their flagship Pinkberry frozen yogurt. We started with the Green Tea & Peach Pinkberry. Of course we had the large order that comes with 7 wonderful toppings good for sharing. 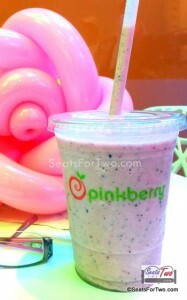 But something new you might want to try this summer are the Pomegranate Pinkberry and the Strawberry Pinkberry. The former is made with 100% California grown pomegranate juice which are known for their antioxidant properties and high vitamin C, potassium, and fiber content. On the other hand, the latter is sweet, refreshing, and has a slight creamy note best paired with Balsamic Glaze. 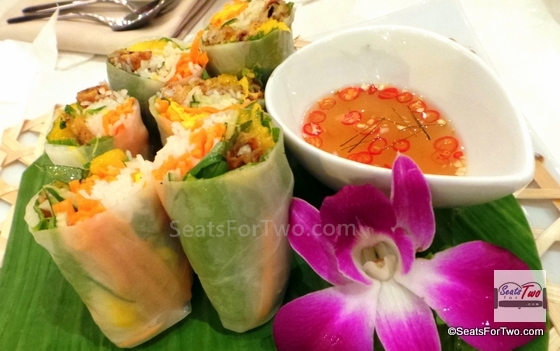 You can also have coconut flakes, and a waffle cookie to go with it. Aside from yogurt, we also had a serving of smoothies. Wifey got herself some Mixed Berries smoothie goodness, which we shared as well. Did you know that all Pinkberry Smoothies are now made with Light Agave? It is a natural sweetener used as sugar alternative. Its carbohydrate in the nectar has low glycemic index which provides sweetness without the unpleasant “sugar rush” and unhealthy blood sugar spikes. 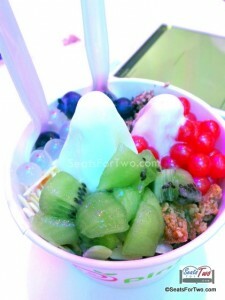 Lastly, Pinkberry is introducing the new Pinkberry Shaved Ice which is a mix of fresh cut fruits, premium selected toppings, vanilla milk, shaved ice and original yogurt. Needless to say, it was a delight to be back as the Pinkberry goodness brought back memories from the Greenbelt and Powerplant branches. 🙂 The taste quality and consistency of the yogurt stayed the same, as you would expect from a widely known yogurt brand in different parts of the world.